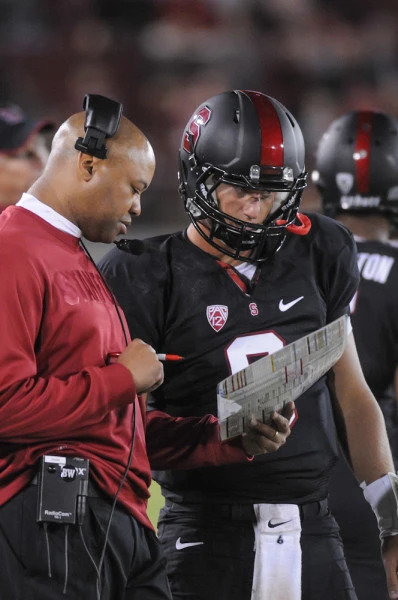 Football Head Coach David Shaw was named the 2012 Pac-12 Coach of the Year on Monday when the conference awards were announced—24 players earned individual honors as well. In just his second year as Stanford’s head coach, Shaw has now won the award for two straight years. Only three other coaches in conference history have earned the honor in back-to-back seasons. “When your peers vote for you, I can’t tell you how much I appreciate what guys think of the work that we’ve done here,” said Shaw. Shaw guided his team to a 10-2 regular season record, giving the Cardinal three consecutive 10-win seasons for the first time in school history. Despite the fact that not a single voter in the preseason media poll picked Stanford to play in the Pac-12 Championship Game, it won the North Division title and has the chance to lay its hands on the conference trophy Friday night. The former Stanford wide receiver credits his coaching staff for the team’s continued success. In particular, defensive coordinator Derek Mason has been named a semifinalist for the Broyles Award, given annually to the nation’s best college football assistant coach. Five Stanford players were named to the All-Pac-12 First Team. Tight end Zach Ertz and offensive lineman David Yankey were selected for the offensive unit while linebackers Trent Murphy and Chase Thomas and safety Ed Reynolds represented the Cardinal on defense. Stanford tied Oregon for placing the most players on the first team. An additional five Cardinal players—running back Stepfan Taylor, offensive linemen Kevin Danser and Sam Schwartzstein and defensive ends Henry Anderson and Ben Gardner—were awarded second-team selections. Stanford also had the most honorable mentions with 14 players. “We recruit not just great players, we recruit the right kind of players,” said Shaw. “We recruit the guys who can do well in school here and play well and play physical and play tough. And when games get tough and get tight they don’t fold they band together.